Euthanasia is a hot political topic in New Zealand as David Seymour’s voluntary euthanasia bill has been drawn from the ballot forcing politicians to confront this important issue. 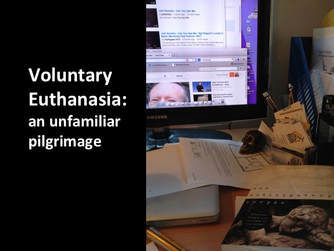 I support euthanasia and have done for many years. For me it is the mark of a compassionate society to hear the suffering of humans and to help alleviate that suffering even if our own sensibilities are offended. A small skull sits on my desk to help me remember that death is my beginning and my end and a tease along the way. Flicking me provocative glances early on then keeping her distance until now I see she’s trying to be best friends, intent on a partnership because she is my destiny. When life no longer holds any meaning for me I want the choice to self terminate and I want that choice to be respected as the choice of a thinking human being who has worked hard to figure out how to live with meaning. I do not want to be patronised by people with power of any kind; including medical professionals telling me I am depressed or unable to make my own decisions. When the time comes it will be important for me to ritualise the end of my life with family and friends. To tell stories, to give thanks for my life, to drink a glass or two of beautiful bubbly, to read some of my words again, the ordering of which has given me such joy, to bless the people I love and be blessed by them, and in a dignified way, acknowledge that it is done. When I have been expected all my adult life to take responsibility for myself, it seems like the ultimate betrayal of a society, a glaring lack of compassion to have this final task of the greatest meaning taken from me. But this desire is a bridge too far for some. The worry seems to revolve around the question of what will become of us if we embrace the ability of our community to self terminate? Will we end up as monsters, devouring our own kind, adrift in the universe without moral code or compass, lacking even shreds of compassion for others and ourselves? Nevertheless, major, existential community fears need to be listened to, sat with and explored. In particular, we need to address the overwhelming fear that we are not enough to competently, wisely and compassionately manage the creative life force that energises us for a time before it slowly starts to wane. Once many might have appealed to an omnipotent, external God or a sacred text for guidance, but more often now the realisation is that we have to take responsibility for life and develop the faith in ourselves that we can do this with compassion, love, justice and mercy. But can we listen to one another, respect autonomy and individual choices whilst living in the tension of a wider community? Are we up for it and what if we get it wrong? What will guide us? Read the full text of this article taken from a presentation given to the Voluntary Euthanasia Society in Wellington, New Zealand. Download the text here. Prev Waru the movie: questioning patriarchy?